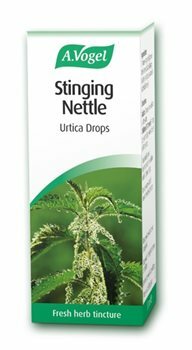 We are all familiar with the Stinging Nettle (Urtica) This fresh herb tincture captures the benefits of this commonly found herb.Urtica is better known by its common name, the Stinging Nettle, which only too clearly defines the reason for its general unpopularity. Its usefulness was known as far back as Roman times and Alfred Vogel encouraged its growth within his fields. Today our gardeners carefully nurture their crop and twice each year harvest the fresh plant tops for use in this tincture. Tincture of organically grown fresh Urtica dioica (Stinging Nettle) leaves and root, extracted in alcohol (50% v/v).